You might not realize it, as you take public transit or a car to and from your job or classes, but the longest commute of any mammal is taking place just outside the Golden Gate. 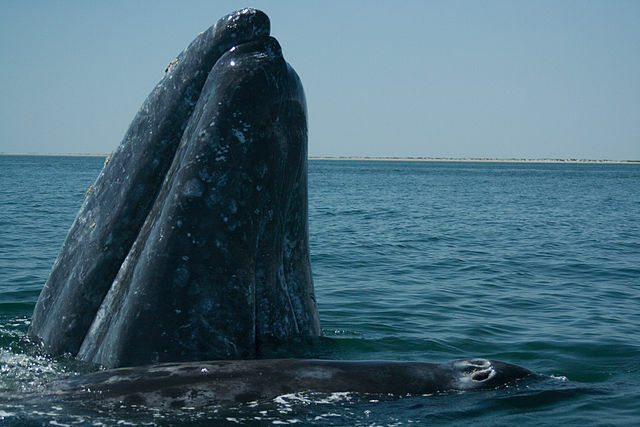 The gray whales are migrating north, 10,000 miles round-trip, from their birthing lagoons in Mexico to their feeding grounds in the Arctic seas. In the far north of their range, scientists are finding the healthy Eastern North Pacific population that migrates along our coast is actually mixing with the highly endangered Western Pacific gray whales with only about 214 animals remaining. The International Union for the Conservation of Nature, the largest and oldest international environmental organization, is providing advice and publishing conservation threats against the Western Pacific gray whale population. How do you estimate a population that stretches out along the entire west coast of North America in a parade that heads south from October to December, then turns around almost immediately and heads back through May? There are actually many counts that occur, but I’ll highlight two counts that have been tracked for years and help scientists monitor the whale population. Scientists with the National Oceanic and Atmospheric Administration (NOAA) count them on their journey south from the Arctic at the Granite Canyon Station (11 miles north of Carmel, CA). Data from counts dating back to 1968 show a steady recovery of the population, now estimated at “pre-hunting” numbers of about 19,000 animals. Gray whales reached the brink of extinction due to over-hunting in the 1800s-early 1900s. The International Whaling Commission gave them partial protection in 1937 and full protection in 1947. Later, they were listed as an endangered species. They recovered so well with these protections that in 1994 they were “de-listed” and removed from the endangered species list. They’re still protected by the Marine Mammal Act of 1972 under U.S. law and also protected by the International Whaling Commission. Journey North uses citizen science observers to track migrations and seasonal changes around the globe. 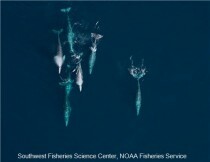 Gray whales are one of the species highlighted on their website, with monitoring stations at Point Vicente Interpretive Center, Los Angeles and Coal Oil Point near Santa Barbara, tracking their northbound trek. Their posted daily census has four years of data on the Journey North website and notes a decrease in numbers over the last three years. Some factors explaining the decrease include storms and migration paths further out to sea. They did have a really big day this year with 94 whales sighted on March 1st from the Los Angeles station. Their data also shows that cow-calf pairs are more commonly seen beginning their northward migration after April 1st. You can view the gray whales now through the end of April from the bluffs along the Pacific shore or head out to sea on a whale-watching cruise. Point Reyes Lighthouse is my favorite viewing spot to watch cow-calf pairs as they make their way to the Arctic. They have a shuttle bus that takes you from Drakes Beach to the parking lot at the lighthouse on spring weekends due to heavy visitation. Learn more about the Point Reyes National Seashore viewing possibilities on their website. You can also check "Gigantic Journeys" a previously published blog about the whale migration for more details about areas to watch them.